Not every flower can tolerate full sun. In fact, some will burn and wither away in hot temperatures and direct sunlight. If you have shady areas of your yard that you want to fill, there are a host of shade perennials that’ll help beautify them. Adding shade perennials to your garden can complete your landscape design and fill your yard with new textures and colors that you’ll surely love. Plus, they’ll come back next year and possibly many years after that, too! This means you can purposefully design sheltered areas of your yard to look lush, ethereal, and peaceful. Hosta varieties are the workhorses of gardens across the globe. Hosta is a must-have perennial that’s not just nice to look at, but low-maintenance, too. Use this perennial when designing your garden borders and shady areas of your yard. 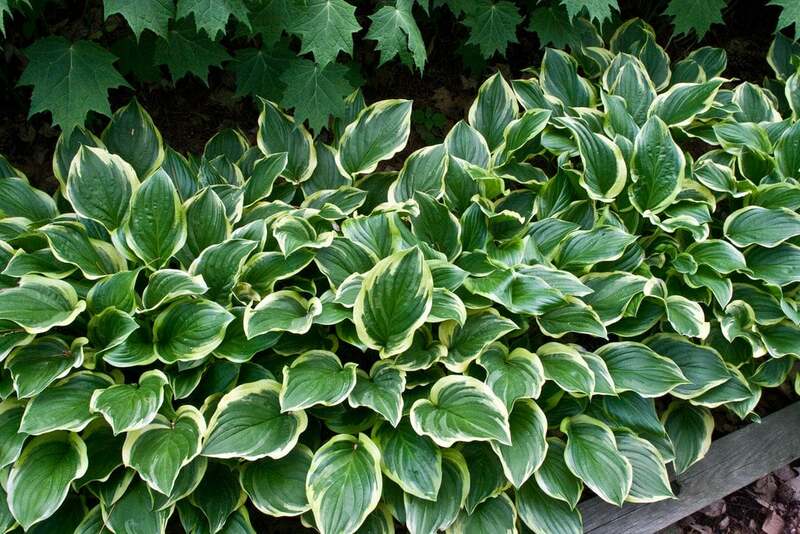 Hostas can be used as ground cover and border gardens. They also make a stunning contrast to delicate and color-rich perennial flowers. Hosta grows well in zones 3 to 8 and does best in part-to-full shade. Hostas are easy to grow but prefer well-drained soil and medium moisture. Be warned – this plant is susceptible to snails and slugs who love to feed on it, so be proactive by making your own natural insecticides. (Read this post for quick and inexpensive DIY garden pest solutions). People love astilbes for their tall, fern-like flower clusters and bright pops of color. These low-maintenance perennials thrive in full shade and can burn or turn brown when exposed to direct sunlight. Astilbes grow well in zones 4 to 9 and bloom in late Spring and early Summer. Luckily, they’re both rabbit and deer tolerant, so they’re an excellent plant to add to woodland gardens. Make sure to plant them in rich and well-drained soil. Water regularly so that the soil never dries out, but be mindful of over-watering. 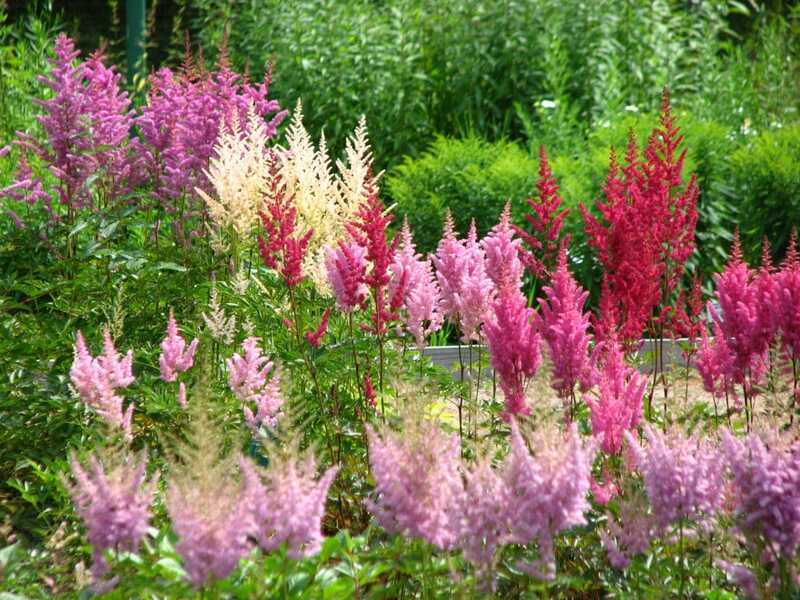 For a detailed guide on how to grow astilbes, check out this blog post! Who wouldn’t love a few of these precious blooms in their garden?! Bleeding Hearts are low-maintenance and provide unique, heart-shaped flower petals in shades of pink that will make you swoon with admiration. They’re so beautiful that having them in your garden will make you look like you’ve been gardening for years. Imagine them next to your hostas or ferns! Bleeding Hearts do well in zones 3 to 9 and will bloom in late Spring. This showy perennial is rabbit-tolerant and prefers well-drained, fertile soil that’s sheltered from direct sunlight. There’s nothing like watching a beautiful Fall garden grow as the season changes to cooler temperatures. The Autumn Anenome, which comes in various colors, is the perfect shade perennial for a Fall garden that is lush with ferns and other foliage-rich plants like the Fireworks Goldenrod. 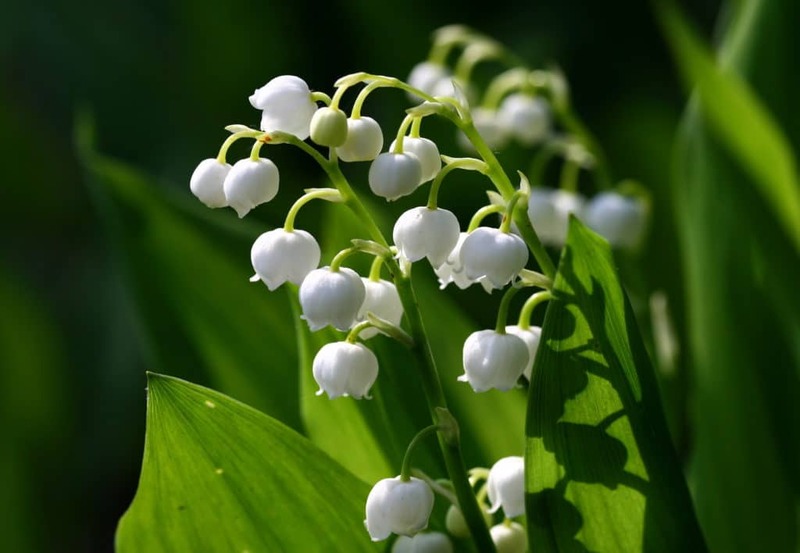 These beauties are known to spread quickly in moist and fertile soil. Plant them in the Spring in zones 4 to 8 for August and September bloom. Autumn Aneomes are deer tolerant and can also tolerate some sun! There’s a never-ending variety of ferns, so choose those you love and those that grow well in your zone. If you’re looking for generous ground cover to liven up sparse areas of your yard, you’re going to want to plant a few fern varieties. Ferns are beloved among gardeners because they can be used for garden borders and for adding greenery to otherwise plain front and backyards. 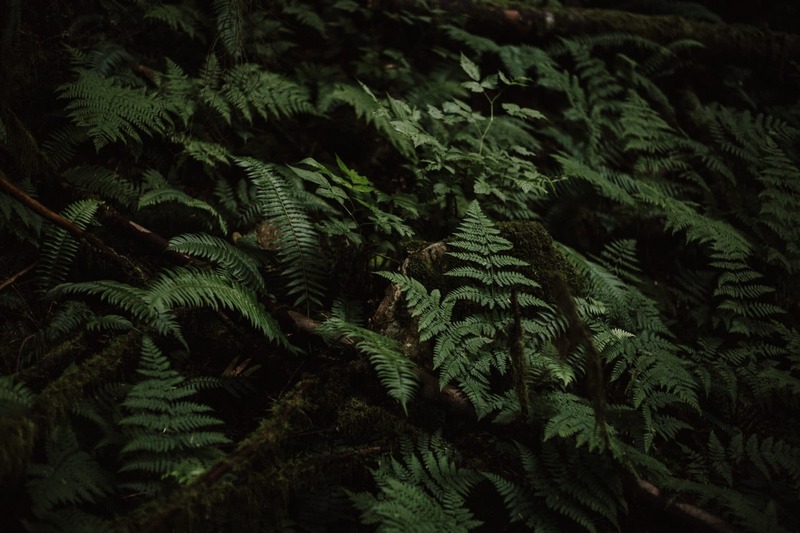 Many fern varieties do well in zones 3 to 9 and do best in part to full shade. Provide your fern with moist and well-drained soil that’s rich and acidic. 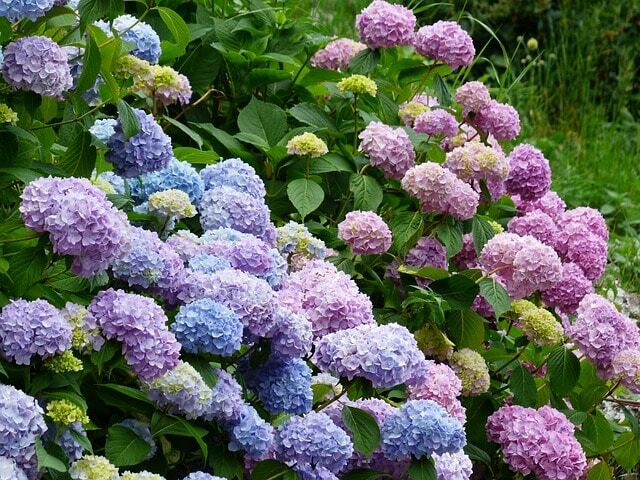 Believe it or not, hydrangeas are actually a low-maintenance perennial and their color can be changed to blue or pink by adjusting the acidity of the soil. Click here for a detailed hydrangea growing guide that can help you master this beauty in no time. Not much needs to be said in regards to the beauty of Lily of the Garden. A quick look at the picture below tells it all. This delicate shade-loving perennial not only features white arching flower petals, but its green foliage is perfect as a ground cover. It’s also fragrant and deer and rabbit-tolerant! If you’re looking to grow a fragrant garden, this post will help you choose your flowers. Lily of the Garden grows well in zones 3 to 8 and blooms around April. Grow it in well-drained, fertile soil. It’s especially suited to woodland gardens. Every gardener should grow Periwinkle at one point or another (as long as it grows well in their zone!). It’s a true, popular classic. Periwinkles bloom from early-to-mid Summer and do best in part shade, but can also tolerate full sun. 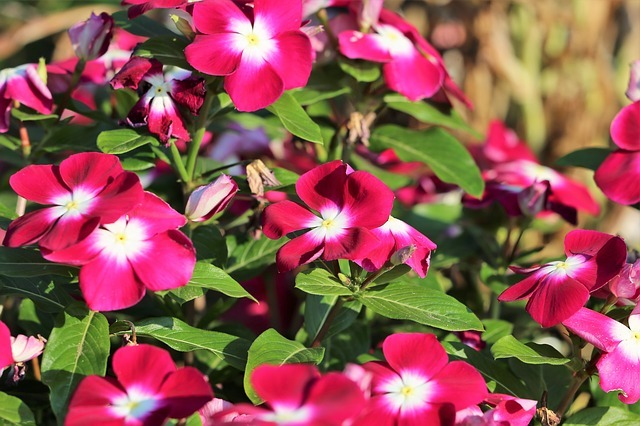 Periwinkles grow well in zones 4 to 8 and prefer humusy, well-drained soil. They spread quickly, so use them as ground covers. This showy shade perennial will bloom in your garden from April to June if planted in the right conditions. 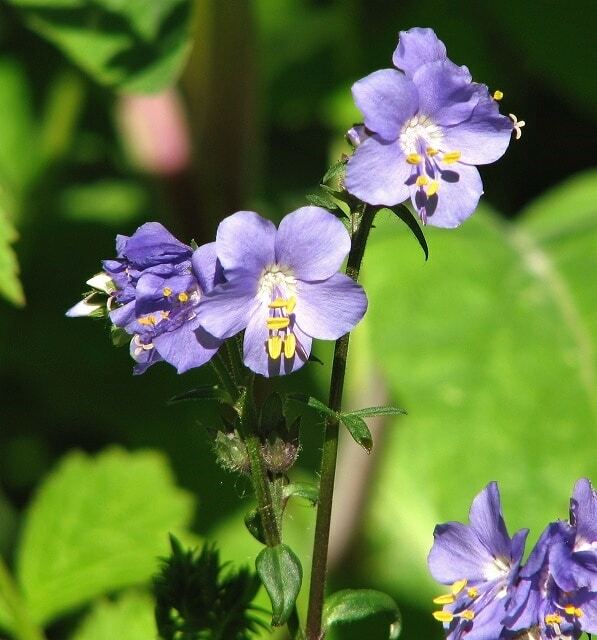 Jacob’s Ladder does best in zones 3 to 8 and prefers moist and humusy soil. While you can plant this beauty in part shade, it can also tolerate full sun as long as you don’t live in a region with harsh Summers. This plant is also deer-tolerant and self-seeds easily so don’t be surprised if it starts spreading beyond the spot in which you originally planted it. If you’re a fan of blue or light-purple blooms, this is an excellent choice. Shady areas of yards can usually use some bushy foliage. If you need generous foliage, look no further than Japanese Forest Grass. 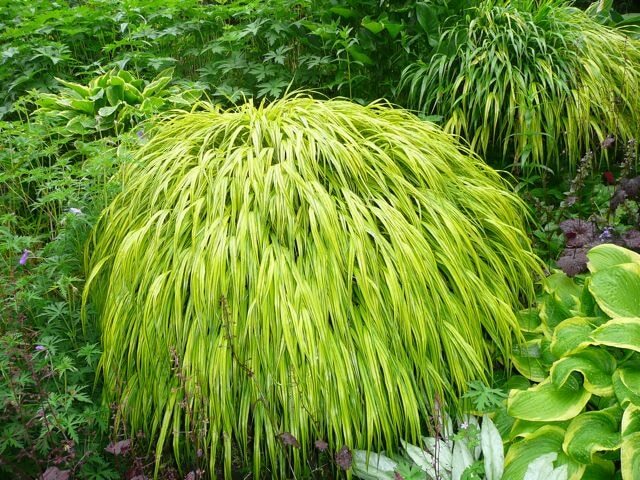 This is an especially great choice for you if you like adding interesting textures and leaves to your garden. Pair it with your hostas for a stark but fitting contrast. This shade perennial does well in zones 5 to 9 and blooms in mid-to-late Summer. The color is more of a light green with yellow tones than a true or dark green, which actually makes it perfect for adding a layering effect to your garden. Consider including this perennial to your plans when you do a full landscape design for your home! 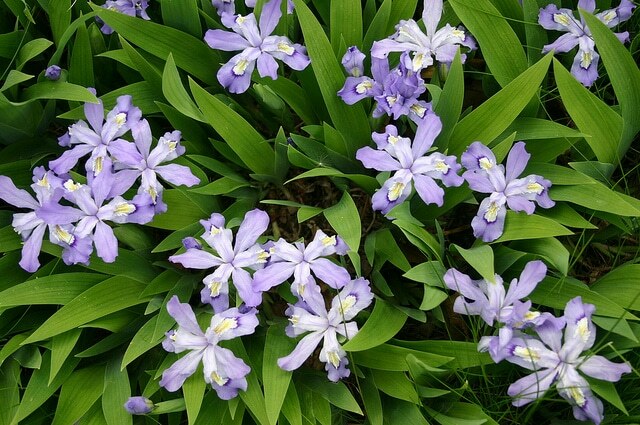 If you crave a flower that features blue-violet blooms, plant a few Dwarf Crested Irises. Isn’t it an interesting-looking flower? The shade and position of the petals are enough to add an exotic flair to a plain garden. Plus, the foliage makes a good ground cover once the flowers have finished blooming. This Iris variety grows well in zones 3 to 9 and begins to bloom in April. It grows low to the ground and is also deer-tolerant. This is a nice flower to add to your rock garden, woodland garden, or to your garden borders. Hellebores are some of the prettiest perennials out there, but lots of gardeners aren’t familiar with the name. Now you are! These beauties come in different colors so choose a shade you think will go well with the rest of your garden. 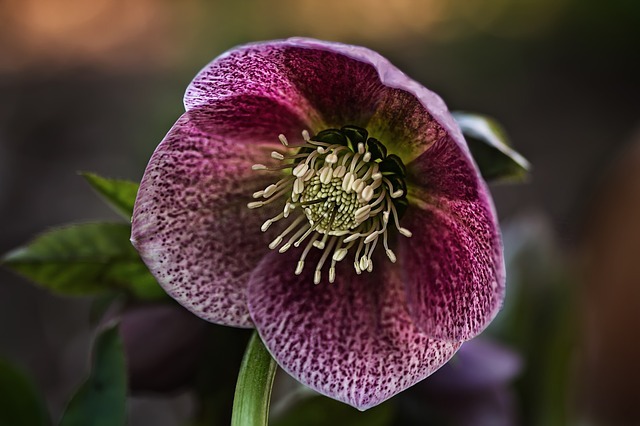 Hellebores grow well in zones 3 to 9, depending on the variety. They can tolerate drought conditions and deer but do best in rich, well-drained soil and part to full shade. One of the best things about this shade perennial is that it has a very long blooming time: it can bloom from late Winter through the end of April! Add this pretty flower to your low-maintenance perennial garden and you won’t be disappointed. That makes up my list of shade perennials that can easily beautify a simple garden. Now you have a few options to consider when you begin to design your shade garden. 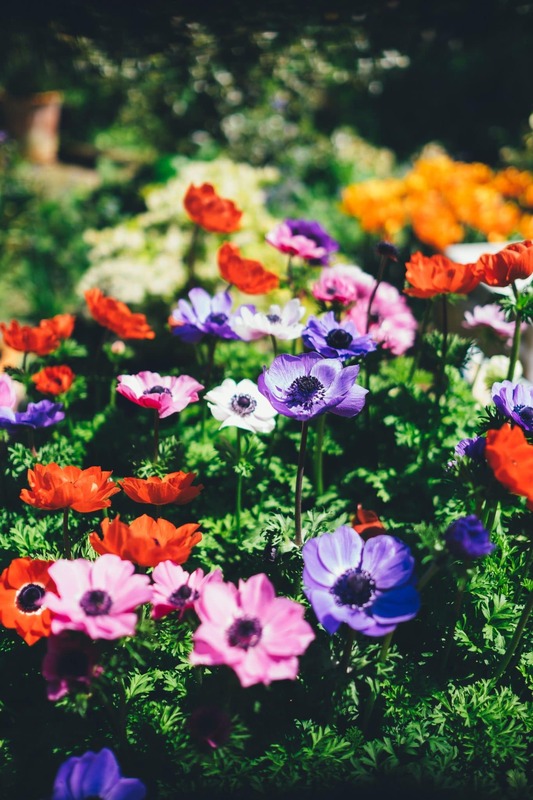 Remember, perennials usually come back year after year if properly care for, which means you’ll save money because you won’t have to keep purchasing new seeds or potted plants. For a list of perennials that thrive in full sun, check out my full-sun perennials post!